On the first day of our journey we traveled from Chennai to Tirupati and visited many places of history, spirituality, politics, culture and religion. All these factors have a huge influence on the contemporary Indian society. We visited the birthplace of Christianity in India, and the birthplace of British rule in India – and realised the two aren’t related! We visited one of the holiest temples in India, which is one of the most visited and richest temples in the world. We met three very different people – Reddy Amma, Vijay Naidu, and K Srinivas Raju – each in three very different places in life – yet found a common bond of faith, self-belief, and humility in them. We also visited the ancient Chandragiri Fort and the Kalahasti Temple. Our first leg done, we’re delighted by the way its begun. And we’ve only just started! St Thomas Mount is a Holy place of international prominence, historical eminence, religious glory and tourist attraction. The ancient Church on the top of St. Thomas Mount has served as the light house for the Portuguese and Armenian ships and vessels in the Bay of Bengal in the 16th and 17th centuries. St Thomas Mount soars some 300 feet (about 91metres) high above the sea level. In keeping with the progressive policies of all religions in today’s world, the Church has also brought in Hindu traditions like a Temple Chariot and Temple Mast into the Church’s architecture. St. Thomas, one of the disciples of Jesus has stayed and prayed on this hill. In Tirupati we were met by Vijay Naidu a top executive of the Amara Raja Group. We then went to the Tirumala Temple, popularly known as the Tirupati Temple. Vijay Naidu had arranged a viewing of the Teppam Float Festival in the night where the Lord of the Temple and his consort are taken on a float around a temple pond. It was a very rare and great photo op. 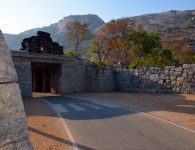 Chandragiri Fort: Vijay Naidu showed us around the Fort at the base of Tirumala Hills, and patiently explained its history and importance. The king’s Palace in the fort, is one of the finest examples of Indo-Saracenic architecture of Vijayanagara period, this imposing three storied palace adorned by the crowning towers representing certain Hindu architectural elements, was constructed with stone, brick, lime mortar and is devoid of timber. The central tower that covers durbar hall rises through two storeys. It is said to be the same venue where Sri Rangaraya granted the site of Fort St. George to the British in 1640. Chandragiri was under the rule of Yadava Naidus for about three centuries and came into control of Vijayanagar rulers in 1367. It came into prominence during Saluva Narasimha Rayalu. Chandragiri was the 4th capital of Vijayanagar Empire, Rayas shifted their capital to here when Golconda sultans attacked Penukonda. In 1646 the fort was annexed to the Golkonda territory and subsequently came under Kingdom of Mysore rule. It went into oblivion from 1792 onwards. Vijay Naidu had arranged for a private meeting and interview with K Srinivas Raju, executive officer of the Tirumala Tirupati Devasthanam who is the head of the Board of management of the temple. The interview was very interesting as he shared his thoughts with us, on how administration and faith are related! Later on, we went for dinner to a typically local eatery popularly known as “Reddiamma Mess”. Bhairavi and Mahesh had a long discussion with this lady who has the whole world at her command. Backed by immense self confidence that comes from her own self reliance, Reddy Amma sits authoritatively in her small but popular eatery, and exudes an aura of power that radiates naturally from her face, eyes and body language. That night, Vijay Naidu ensured that we stayed as his house guest in his house in Tirupati – such is the hospitality of good friends!